This photo is dated August 8, 1950. I have to assume that this group is made up of Fieldcrest employees. 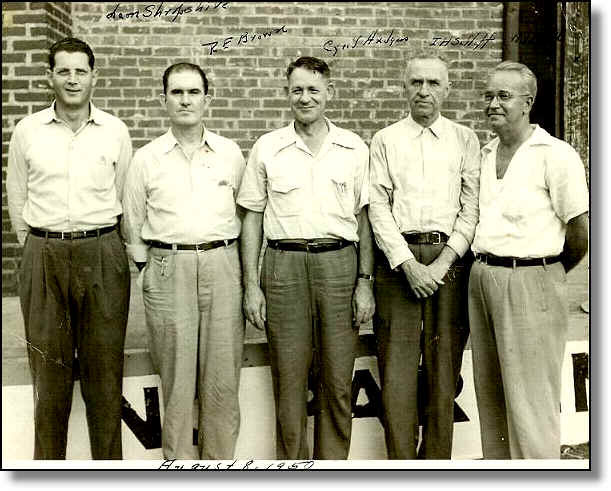 The names printed on the photo read: Leon Shropshire, R. E. Brown (my grandpa), Cyril Hudgins (? may be Hodges), I H Sutliff, N V Hall. Mutual Aide Association is written on the side. I have no further info regarding this photo, but it looks like it was made in front of a loading dock. If you look behind these gentlemen, you can see "NO PARKING."